Fall is in full swing and Halloween is right around the corner. At Mr. Tree and Lawn Service we love to see all of the creative ways our customers like to decorate their yard for the holiday. So just in case you’ve waited and haven’t decorated your lawn just yet, we’ve put together some cool ideas that are easy to put together at home. Check them out. Turn a yard full of leaves into a pumpkin family in little to no time. Simply buy some trash bags that have a pumpkin face on them (these are often available at the supermarket during the fall) and stuff them with leaves! The more bags of leaves you have – the bigger your pumpkin family will be. It’s an easy way to efficiently clean and add personality to your yard. One of the easiest things to decorate for Halloween are your potted plants. Whether it’s just a simple homemade spider web, plastic bugs crawling in the plant or a fake hand protruding from the soil of the plant. There are so many ways you can incorporate your plants into the decoration. Your fence can be easily incorporated into a Halloween decorative scene but can also be easily forgotten. Decorating your fence is similar to decorating your pots in the sense that you have many decorative options and visions you can explore. Whether you’re wanting to make your fence look old and worn, spider infested or splattered with blood (fake blood, of course), your fence can be a great prop in decorating for Halloween. 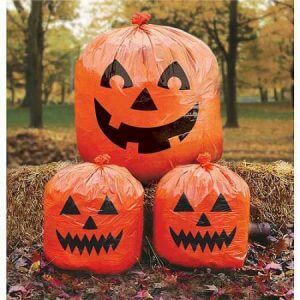 So whether you’re looking to make your yard look spooky, scary or friendly this Halloween, these ideas are definitely great places to start. Embrace your creativity this holiday season and let it show in your lawn. Happy decorating! For more information about our services at Mr. Tree and Lawn Service, visit our website or give us a call at (352) 682-4444. Are you a current Mr. Tree and Lawn Service customer? Rate and share your experience with our team in the review section of our Facebook page today. We always enjoy hearing from you!